The Trent Market Garden project began in late 2014 and continues today in its early planning stages. Below are the mission statement and vision for the future and potential of this initiative. integrating on-campus grown produce into the campus cafeterias. Governed by the principles of food sovereignty, the Trent Market Garden strives to be a leader in sustainability, while fostering community development, and operating with economic self-sufficiency. By bringing together members of our community through the fundamentality of life-food, the Trent Market Garden is helping Trent to grow. So what's this Sustainability Committee all about? Food on campus is a really important issue for students, and one that relates to health, political participation, culture, environment, education, social interactions - ok, well, everything! Everyone Eats. Food is also a subject that we can engage with creatively (i.e. hopefully not have too many meetings about, but focus our energy on activities that will generate conversation, awareness, and inspire changes). With our new food service provider (Chartwells) and a new contract that has significant sustainability and student engagement goals built into it, students now have the opportunity to work in a collaborative way with Chartwells to make real forward movement, and create positive changes to the campus food system. Raw Deal", an analysis of student opinion regarding food services (data collected in 2011) and recommendations for improvements. (If you are not, you can look it up). These recommendations were one source that informed the development of a new food services contract. There are now a number of concrete sustainability goals built into the contract, and our task is in part, to apply pressure to ensure their implementation, and monitor the results. What exactly do we mean by "Sustainability" anyway? That's a really good question. As we all know, the term is ambiguous. In this context, we are primarily talking about environmental sustainability (although this is of course embedded in socio-economic sustainability). How we decide to engage with these tasks will be up to us. Anisah will then bring feedback in the form of a summary report to the monthly Trent Food Services Advisory Committee Meeting. Who is going to sit on the Sustainability Committee? representatives from Sustainable Trent, OPIRG, KWIC, SAFS Society, TUNA, Meal Exchange, the TCSA, College Cabinets, Residence Life Co-ordinators, the GSA, and the Trent Sustainability Office, possibly a faculty member, (any suggestions on who to invite are welcome), as well as Chartwells' Marketing and Sustainability Manager. The SAFS program was allocated 33 acres of land behind the DNA building by Trent for an “Experimental Farm” in 2014. The land has been designated primarily for research purposes and there is a committee working on short and long term visions for its operations. This summer the first projects included 1/3rd of an acre of vegetables as part of a organic amendments research project, 1 acre of organic Quinoa, and a research project on reducing inputs in common Ontario grain rotations. 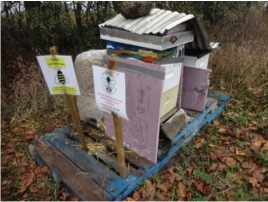 Furthermore, Whitney Lake, a 4th year student at Trent initiated the Trent Apiary, installing and managing two honeybee hives on the “Experimental Farm” and actively mentored students throughout the fall in the art of beekeeping. Plans for future projects at the “Experimental Farm” include undergraduate and graduate research and experiential learning opportunities, demonstration projects in sustainable agriculture models, and ideas to scale up food production on campus. The idea to increase campus food production and link it to campus food services is being supported by Chartwells as part of Compass Group’s cross-Canada Key Focus Initiative Project. The KFI means that the new food services provider is committed to supporting Trent in creating an environmentally, economically and socially sustainable food production enterprise on campus by purchasing the student grown produce for use in campus meals. Chartwells has also committed to providing capital for investment in a campus greenhouse the planning of which is only just beginning. These projects show potential for real, forthcoming and positive change in relation to the Trent Food System; creating awareness, community engagement and corporate responsibility around broader food and agriculture concerns. The Trent bees are still active with the nice days we have been having, but cold weather is on the way. I was up visiting the hives on Saturday, placed some straw against the north side and a wind break to the west to help them stay warm. Stay tuned to Trent Radio on Monday from 4-5 to hear all about bees and pollination! 92.7FM. 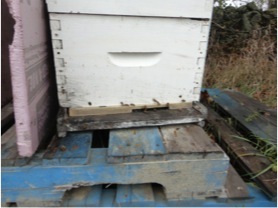 But winter doesn’t mean our bee-keeping work is over, rather it is just getting started. Now we need to organize our club, if you are a great organizer, we want you! We also need to plan for the spring, and start building & painting new boxes. It is also the time we order our “nuks” and queens for 2015!